The Doctor smiled as he watched Miche and Susan on the sofa together. Young love. Well, they deserved it. He pretended to be busy with something at the console and tried not to look at them when their kisses lengthened and deepened. He tried not to hear their words, though it was difficult not to. He found it strangely difficult to filter out the conversation at the edge of his superior Gallifreyan hearing. “Suzette, ma cherie,” Miche murmured happily as he caressed her face gently. She giggled softly. The Doctor smiled again and decided to look at the circuits under the floor. But they had stopped talking about him now. They had stopped talking at all. He looked at them and grinned. He grinned and sat back on the Command Chair with his feet jammed against the console. He closed his eyes and let himself drop down into the lowest level of meditative trance. He was still aware of his surroundings. He could FEEL the presence of the two young lovers in the room. He could sense the TARDIS engines working perfectly as they span through the vortex to the leisure planet of Avidos where Susan had really enjoyed the anti-gravity swimming pools on their last visit and he was sure she would enjoy even more with Miche to swim along with. Meanwhile he let his mind reach back to Forêt. He had taught Dominic some techniques to help make their telepathic conversations less exhausting and he found his son easily. “Mon Pére,” the boy cried joyfully. “What is she singing?” The Doctor asked. “Ah.” His own two hearts beat a little faster as he remembered singing that one to her by the fire in the evening. Together forever till the end of time. “Together forever till the end of time,” he echoed the line. I shall come back! A promise he made to his granddaughter, Susan, a long time ago. And he had never fulfilled that promise. For reasons he couldn’t even explain to himself, let alone to her if he ever looked her in the eye again. But now he had a second chance to do it right. And he promised himself he would. “Doctor….” He was aware of Susan’s voice near him. Not his granddaughter, Susan, who he had been thinking of in that moment, but his other Susan. Miche called his name, too. And it sounded urgent. He said a hasty goodbye to Dominic and broke the mental connection. As he did so, he became aware of the reason for the urgency. He jumped up from the seat and ran to the communications console. “I’m going to do what I can,” he told her. “As I always do. But before you even think it, no, the TARDIS can’t carry 100,000 people. And even if it could, there wouldn’t be time.” He turned back to the communications console and flicked a switch. 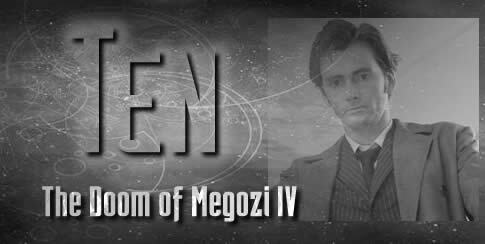 The alarm turned off as he connected the videophone link to the source of the signal on Megozi IV. The face that filled the screen WAS humanoid. Eph Tertians were about the same height and body shape as humans, but they were pale green and had darker green mottling where humans had hair. The one that spoke was female and identified herself as Shorlor Eph'Anepha, High Consul of Megozi. Consul Anepha’s strained face seemed to lighten with gratitude. “I’m The Doctor,” he replied. “Doing what I can is my middle name.” He smiled broadly at her. The Consul looked curiously at him. It seemed so long since anyone had smiled around Megozi IV. It lifted her tired spirits. She managed a worried smile in return before she cut the communication. “Ok,” The Doctor said turning to his companions. “Battle stations. Well, lifeboat stations. Susan, Mich, medical centre. Get all the doors between here and there wedged open and then bring bandages, lint, burn ointment, splints back here to the console room to be ready. We’ve got earthquakes, mini volcanoes, super-heated water vapour, the lot down there. We’ll be dealing with broken limbs, burns, what else? The Doctor smiled widely at her. His reasons for wanting to bring her with him were strange – one at least was because she was called Susan and hearing his own voice say that name out loud gave him a strange kind of kick. But he knew, right now, as she uncomplainingly went to do the most mundane tasks because right now that’s what was needed, that he had made the right decision. He looked at the co-ordinates. One of them was a hospital, another a school, a mining community where workers and their families waited in hope of rescue, another school. He didn’t know if he could reach them all. He didn’t know if he had to, or if there were other volunteers on their way to help. And he didn’t know which he should help first. They were all in equal danger. And the ones he failed to reach were going to burn his soul. But even as he thought those thoughts he was selecting the first co-ordinate at random and materialising. It was the roof of a hospital. He stepped out of the TARDIS as a doctor – the other kind of doctor – ran towards him. The hospital doctor sighed with relief and turned to his stretcher bearers, ordering the walking wounded to be brought on board. The Doctor turned and picked up a small child who was sitting beside his mother on one of the stretchers. The walking wounded and the remaining medical staff followed his lead. “There used to be rule against taking unauthorised people on board a TARDIS,” he told Miche as he distributed a box of orange juice cartons he said he had found in a store cupboard The Doctor didn’t even know he had. The console room was teeming with people AGAIN. As soon as the last one was aboard, he fought his way to the console and set co-ordinates for the hospital ship SS Florence Nightingale. The journey took ten minutes by TARDIS. Just long enough to give everyone a drink and basic first aid. On the hospital ship efficient people were there to take over. As the TARDIS emptied, The Doctor turned and looked at Susan and Miche. “I’ll bring out another box of orange juice,” Miche said. “Yep.” He smiled. The TARDIS was rising to the occasion. So was he. Try not to enjoy it too much, he told himself. He realised he was grinning as he worked on the next co-ordinate. Out of the corner of his eye he could see a constantly scrolling screen where reports were coming in from around the planet. Rescue work was going on all over, but it sometimes seemed it wasn’t fast enough. One co-ordinate blinked out. The screen said that the whole office complex had disappeared into the ground. Liquefaction had turned the foundations to dust and hundreds of souls ceased to exist. The Doctor knew there was nothing he could have done any more than any other rescue ship ferrying survivors. But it didn’t stop him feeling the loss deep in his soul. Even so, the adrenaline was burning in his blood as it always did when he went into action. He couldn’t help the chemical reaction it caused in his brain that made it fizz with something like elation in a crisis of this sort. The orange juice went down well with the children and the tea revived the teachers they grabbed from the roof of the school and headed towards the luxury starliner that had been pressed into service as a receiving centre for the dispossessed. Then it was a quick turnaround and he was off again. “Good girl,” he said, patting the TARDIS console as the engines responded as uncomplainingly as his two companions. He smiled at them and tried to think of a similar remark that wouldn’t seem patronising. “Some people aren’t going to make it, are they?” Susan said as she looked at the broad spectrum lifesigns monitor that showed population areas around the whole planet. It WAS down to isolated pockets now. The majority of the population of the planet were either already dead or rescued. But these last few…. She tried to imagine how scared they must be. She had seen her share of disaster movies where small groups of people clung onto the hope that somebody was coming for them. Scenes passed through her mind almost at high speed of burning buildings, volcanoes erupting, avalanches, global catastrophes. Whenever she saw films like that she wondered what it must be like to be in such a situation, to be waiting, with dread in the pit of her stomach, and hope the only thing keeping her going. Now the TARDIS WAS the hope for so many people. “The TARDIS is going to have a bloody good try,” The Doctor answered. And it did. They stopped counting after the first dozen pick ups. As the time counted down they ferried hundreds of men, women, children from the dying planet to safety. The tea and the orange juice held out, and so did their spirits. It was heartbreaking to know how many hadn’t made it, but the relieved faces of those who stepped inside the strange blue box and realised it WAS, indeed, rescue, gave them the strength to keep going. The man had no answer to the accusing eyes that all turned on him. He looked at The Doctor pleadingly. The Doctor turned away from the man as he tried NOT to imagine the terror of those trapped in the mine, an enclosed space with so few exits, as instant death roared towards them. At least it WAS instant. That was the only consolation there was. Some of the burn victims he had applied first aid poultices to here on the floor of his console room were not so lucky. The number of co-ordinates he had to go to was being reduced by the minute. Some because people HAD been rescued. But many of them because there was no longer anyone to rescue. People WERE dying. At least as many as they were saving. It was a lottery. And the prize was life. The Doctor looked at her for a long moment and thought about some of the disasters he had pitched in with just on her own planet. She probably watched some of them on the news at home with her family, the egg and chips of tea digesting and the report a diversion from homework for a few minutes. He thought of broken bodies he had pulled from rubble of collapsed buildings or from the muddy aftermath of floods, and the few brief moments of triumph when, against the odds some frail Human had survived where others around him were dead. He put his arm on her shoulder. She looked tired. So did Miche. “Another hour then you can rest,” he assured her. “I’d rather keep going another five hours if it meant we could get more people,” she told him. “That’s the spirit,” he said with a grin as they materialised at one more evacuation point. He sprang to the door. He felt pretty well exhausted too, but he wouldn’t let his companions, still less the people he had to help, know that. Consul Anepha turned to look at The Doctor, then she looked down over the edge of the building and saw the lava flowing between the streets as if they were river beds, igniting everything in its path, sturdy buildings exploding into sudden conflagration. She was the last inside, even so, going back to the stairwell to check there WAS nobody else left in the building. Finally she obeyed The Doctor’s by now frantic instruction to her to GET INSIDE the odd looking blue box. She had been hearing reports about it for hours. The strange craft that looked like something that had no right even to fly, but which had rescued so many more people than she had ever hoped could be rescued, from places she knew they could never land a shuttle craft. The Doctor found the co-ordinate. It was in the mountains to the south of the city. It didn’t look that difficult, even so. In the Hall of Worship of the Temple of Aphan, on the side of the mountain of Aphanfut, the followers of Aphan knelt in prayer. Galicus Eph-Anepha stood before the altar and assured his people once again that Aphan would save those of them who were true believers. He glared at the small group of terrified aid workers who had arrived two days before to start the evacuation and denounced them as unbelievers who would burn in the fires. Galicus’s words were drowned out by an animal-mechanical sound that filled the Hall. He stared in astonishment at the strange blue box that materialised around the group of unbelievers, the flashing blue light on top of it casting strange shadows. Some of the Aphan worshippers began to rise to their feet. They looked at the TARDIS with puzzled eyes. They didn’t listen to broadcasts in the Retreat. The point of it was to get away from worldly things and pray. They hadn’t heard the gossip about the blue box that had saved so many lives. But they DID believe in Aphan and the promise of salvation and there was nothing in their holy writings that said salvation could not come in a blue box with a flashing light on top. “Naphal?” The Doctor whispered to Consul Anepha as she stepped out beside him. “WHERE does it say that?” The Doctor demanded. “Here,” Galicus replied, pointing to his feet. The Doctor looked down at a beautifully intricate mosaic floor where the very words Galicus had been intoning over and over were written in gold along with several other quotes from the sacred texts extolling the virtues and goodness of Aphan. Some of the people stirred. They looked at the box. The two doors were open wide and those closest could SEE that there was more to it than met the eye. Miche came out of it with yet another box of orange juice and began to give it out to the children. Galicus looked as if he was about to denounce orange juice as the blasphemous drink of Napha. But his words went unheard. Galicus denounced the comforts the strangers had brought. Some of the parents snatched the cartons away. Others, The Doctor noted with satisfaction, carried on letting their children drink. He saw one mother pour it into the empty feeding bottle of her baby. They were uncertain. The TARDIS and rescue was tempting. But they were used to obeying Galicus, used to believing that he really did speak for their god, that he knew the answers. That there really WOULD be salvation. There was a disturbing rumble. The ground shook alarmingly, dislodging some of the beautiful mosaic tiles as plaster dust from the high, fresco covered ceiling showered the faithful. It was a long way from a fountain of living water. Two young children made a break for it and ran into the TARDIS. The Doctor saw Susan and one of the Consul’s staff grab them and stop them running back out again to their frantically calling parents. Instead, the parents broke ranks and joined them. He saw Susan take them all through to the inner part of the TARDIS where she had organised tea and sandwiches for those who needed them. But the rest were swayed by Galicus. They wouldn’t move. The Doctor sighed and stepped forward until he was standing on the sacred mosaic, despite Galicus’s rage against the blasphemy. Apparently only the chosen priests of Aphan were allowed to stand there. A mother grabbed her two children and ran to the TARDIS door. Two other people watched her and then they grabbed their children and ran. Then a half dozen more. The Doctor yelled out to them to form an orderly queue as they all tried to get through the doors at once. There were falls, there were scuffles. There was panic. Miche and Consul Anepha picked up those who had been trampled in the rush and bundled them inside. The Doctor waited. Galicus stood before his altar and watched as the Hall emptied into the impossibly small blue box. “I will not die. Aphan will save me,” Galicus insisted. “Aphan will save me,” he said again and knelt in prayer by the altar. The Doctor turned and ran to the TARDIS. The Doctor nodded. He wasn’t sure he could stop his own voice from shaking, either. And he couldn’t get Galicus Eph-Anepha out of his mind. In less than twenty minutes he would be dead. The schematic on the TARDIS environmental console told him how. The mountain the Retreat was built on stood over a great subterranean caldera. A reservoir of magma. That magma had been pouring out as lava all over the continent, destroying everything in its path. The caldera was emptying out and the mountain was going to collapse into it, Retreat, and Galicus with it. He would be dead long before the disintegration of the planet turned his remains to burning fragments. The TARDIS materialised on the starliner as she took the phone from him. She reached out and hugged him once. There was no point in arguing. No time to argue, even with a Time Lord. She and Miche ran to help those who needed help, as they had been doing for the past several hours. The Hall of Worship of the Temple of Aphan echoed eerily with the sounds of a building whose foundations were built on a mountain that was about to collapse into the ground, and the prayers of Galicus Eph-Anepha. Aphan didn’t seem to hear him. Aphan had already sent the equivalent of a fire engine, a boat and a helicopter and Galicus still hadn’t recognised a miracle when he saw it. Aphan had apparently washed his hands of his stubborn worshipper. But The Doctor never washed his hands of anyone. Galicus screamed aloud as the altar and the Hall around him faded from view and he found himself kneeling, not on the great mosaic floor with the sacred symbols of Aphan depicted in it, but on a dark green mesh floor beneath which sinister looking valves and coils lit up with a strange green light. He looked around and saw The Doctor standing at the console. “No!” he cried and he ran across the walkway that led to the door. He yanked at the handle until it opened. A forcefield held him back as he tried to run outside. He stared in astonishment. The Hall was gone. He was looking out at space. He was looking at the moon, Aphan’s Light, he called it, that had shone down on the planet at night, but would not shine on any more nights on Megozi IV. 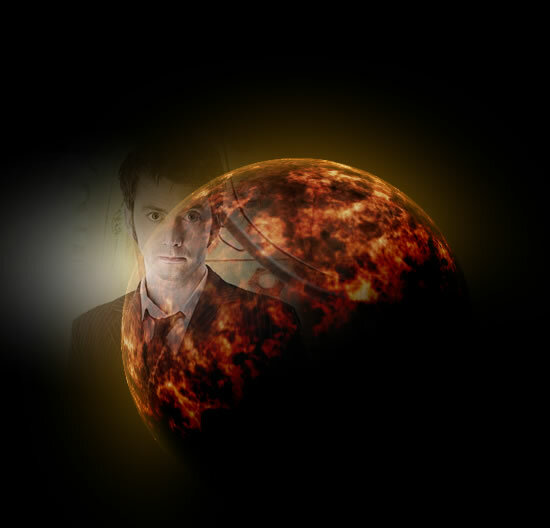 The TARDIS revolved slowly and he saw the planet. It was in its death throes. The oceans had boiled away as the molten core poured out onto the surface. What had once been blue and green and purple where the great mountains rose up and white at the frozen poles, was now red and black and dying by the minute. 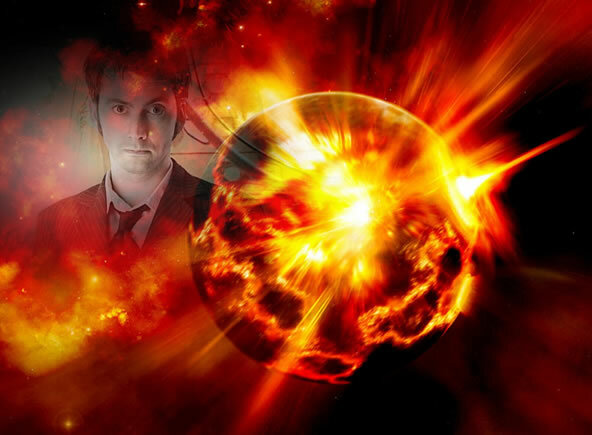 The TARDIS accelerated away and as the view of the planet receded Galicus saw it explode. Debris was flung out far beyond its orbit. The moon cracked into three pieces under the strain as the gravitational forces fluctuated wildly. “Shut the door, its bloody draughty,” The Doctor said, though that was not true. There was nothing to cause a draught. And if there was, the forcefield held it back. “Orange juice?” he asked, holding out a carton. “If that’s what you want to believe,” The Doctor said. “Then yes.” He looked at the long range scanner. He saw the last starliner come out of hyperdrive on the edge of the Megozi solar system. He set the co-ordinates for the mess hall. He wasn’t too surprised when Susan and Miche rushed in through the door the moment he opened it. “Skin of my teeth,” he admitted. “But he’s alive. Not sure what he’s going to do with himself now. I suppose he’ll pick up the pieces like the rest of them. And at least he’s not alone.” He smiled as Consul Anepha ran into the TARDIS and wrapped her arms around her brother. “Job done, Doctor?” Miche asked. “Job very well done,” he agreed as he stepped outside the TARDIS and looked at the survivors. They had all seen pictures of the destruction of their planet on big viewscreens. They were not exactly happy to see their homes, their jobs, their livelihoods obliterated. They had nothing to look forward to but refugee centres and an uphill struggle. But they were alive. And that was what matters.